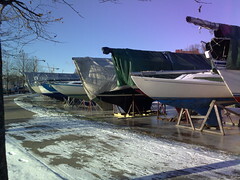 "That one’s an H-boat, and that, and that, …"
I walked to Café Carusel in Kaivopuisto for lunch today, and took this photo of the boats out of the water for the winter. The white boat second from right, with a patchy blue keel and no cover, is an H-boat, the same as our own Kittiwake. And so is the white boat two left of that, and the blue boat left of that, and the white boat two more to the left – you can recognize them by the graceful continuous shallow curve of the bow. There were five more H-boats further along the line: H-boats are the most common type of keelboat in Finland. Eve used to get quite sick of me pointing them out as we walked past the yacht harbour in the summer: “That one’s an H-boat, and that, and that, …”. I never thought that we would have one too.